Lock in a great price for Brooklyn Hotel – rated 8.7 by recent guests! The location was excellent. Breakfast selection was perfect and would cater for even the toughest traveller. The owners went the extra mile. The hosts where very friendly and couldn't do enough for you, nothing was too much trouble for them, room was compy and big, breakfast was very good well worth the price we paid for four days, I will be recommending it to family and friends. Both of the hosts were fabulous, very friendly and they above and beyond. I’d recommend staying here to anyone. it was clean, comfortable and in a great location. The beds were very comfy normally I get backache in any other bed breakfasts were very good nothing was too much trouble for the staff very pleasant location was good I will only stay at Brooklyn now. The owners, the breakfast, the room, everything really. The breakfast was very nice. The staff was very friendly.The room was very clean. Lovely breakfast. Very comfortable bed. Free parking. What more could you want perfect. Friendly welcome, helpful, accommodating hosts. Excellent Breakfast and overall great value for money. Brooklyn Hotel This rating is a reflection of how the property compares to the industry standard when it comes to price, facilities and services available. It's based on a self-evaluation by the property. Use this rating to help choose your stay! In a great location just off Blackpool’s promenade, just a short walk from the center of town, this clean and comfortable family-run hotel offers a warm welcome all year round. All of the rooms with private bathrooms are tastefully decorated with TVs and tea/coffee making facilities. The hotel has a spacious, elegant dining room, a sun terrace and a cozy, comfortable and well-stocked bar. The hotel is in the popular area of North Shore, close to the heart of Blackpool and all its stores and vibrant nightlife. Tucked away, just off the promenade, the hotel is quiet enough for a restful relaxing break while being simultaneously close to all that the town has to offer. Constantly upgrading its facilities and services, Brooklyn Hotel has been awarded 3 stars for Guest Accommodation by Visit England. Please note: reservations for weekends between July 1st and November 6th, and for all public holidays must be for a minimum stay of 2 nights. When would you like to stay at Brooklyn Hotel? 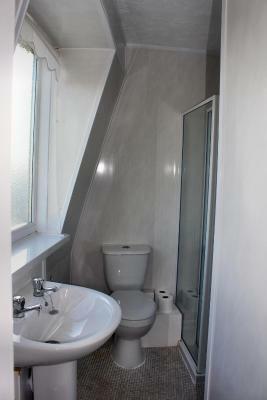 Rooms feature a TV and an en suite shower room. Extra supplements apply if booked for a party of 3 adults. This family room has one double bed and 2 single beds. Extra supplements apply if booked for a party of 4 adults. This room is located on the second floor and is accessed by two flights of stairs only. This property has no elevator. The Brooklyn is a happy, friendly place with no restrictive rules we just ask guests to use their common sense and to be considerate to other guests. Bedrooms are situated over three floors, so some are accessed by stairs (esp. family rooms). We have just three ground floor rooms (1 single, 1 twin, 1 double) so it is always advisable to check availability of these with the hotel. House Rules Brooklyn Hotel takes special requests – add in the next step! Brooklyn Hotel accepts these cards and reserves the right to temporarily hold an amount prior to arrival. Group bookings are for a maximum of 12 guests. Kindly note that some rooms are located on the second floor, and accessible via stairs only. Therefore it may not be suitable for guests with mobility impairment. During the booking process, please specify in the special request box the floor preference, subject to availability. Not having clean cups everyday and drinks replenished. Rubbish bags not being emptied daily. Fantastic breakfast and really helpful owners. great breakfast .location fine for me. tramstop on doorstep . Veronica and bob were so very welcoming, and very helpful regarding information on local area. The hotel was clean secure and warm- we went in january.